Matte-finish, transparent plastic overlays on front cover, back cover and spine present limitless label customization options. Slant rings allow smooth page turning and hold more documents than the same-size round rings. Open and close triggers provide fast, nearly effortless access to single sheets. Binder features back-mounted rings for added convenience. Two inside pockets provide extra storage for loose documents. Poly material is non-stick so inserts, pockets and cover won't lift print. 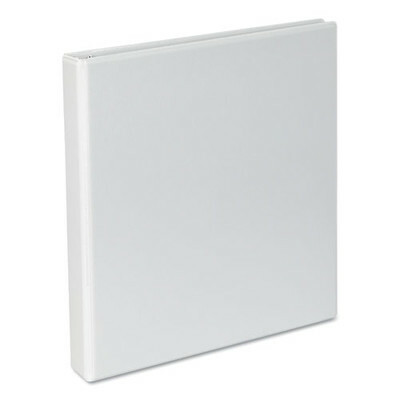 Capacity Range [Max]: 1 inch; Sheet Capacity: 220; Color(s): White; Binder Sheet Size: 11 x 8 1/2.